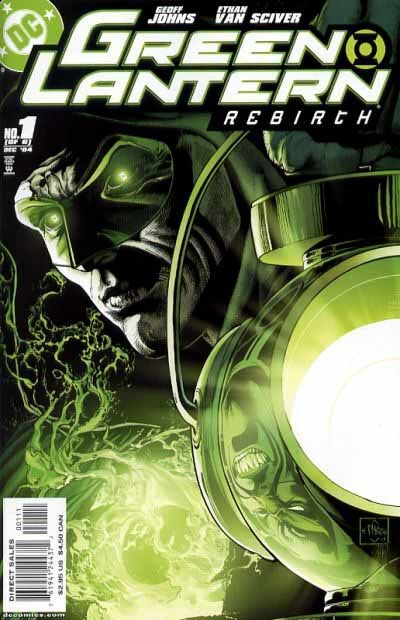 Silver Age Green Lantern Hal Jordan was put through the wringer in the late 90’s into the early part of this decade. First he became a villain, then he died, then he took on the aspect of The Spectre. 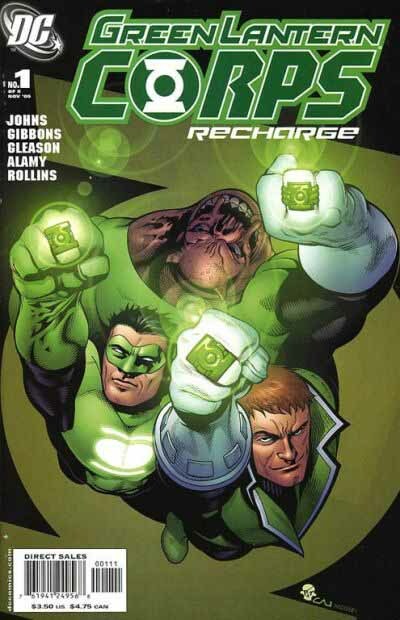 Finally, in 2004, Hal got a break in this miniseries that would relaunch him as Earth’s premiere Green Lantern. A new logo was called for, and Louis Prandi, the DC cover editor at the time, called on a new logo designer as well, Daniel Gelon. Daniel is best known as an artist for card games such as Magic: The Gathering, but in the last few years he’s designed a half-dozen new logos for DC that are fresh and attractive. If its an existing logo, I’ll check them out for any elements of style I like. If its a multiword logo I’l just do thumbs of boxes to get a stacking and relative proportion I like, then I choose maybe 30-40 typefaces I feel have qualities I want. Of those I whittle down to 6-7 that I start playing with letterform relationships, altering letterforms in various ways and creating new ones for letters that aren’t working. When I have several drafts I like, I’ll start altering line widths and thinking about shadows and effects. This usually yields about 5 to 6 initial drafts. These are more finished and developed. 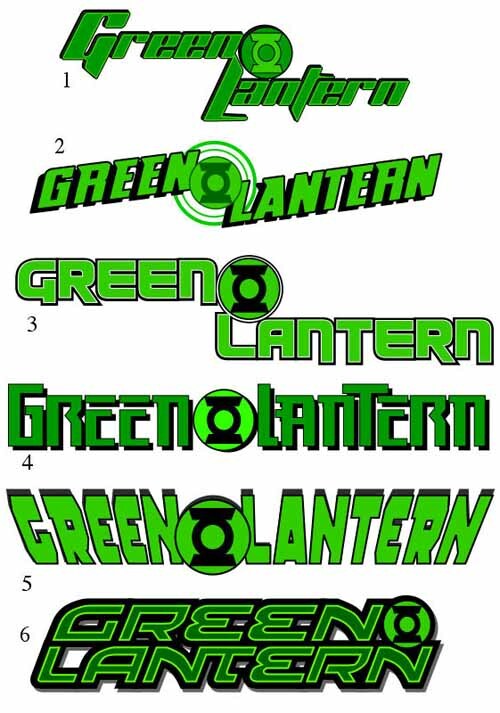 The top one takes the letter forms seen in version 3, enlarges the G and L, and nests them tightly, stacking the words one above the other, with the lantern symbol taking a familiar role by helping fill out the shorter word GREEN’s top line. He’s also switched to a more traditional N, but with an extended lower right corner to match the extended R’s. The rest are variations on the previous version 6 (which is also here unchanged, the bottom one). The middle two also have enlarged and nested G and L’s, and he’s solved the design problem of all the small openings in version 6 by filling in the background with solid black. There’s still a pretty large gap between the G and L, but somehow I don’t mind it in this design, perhaps because everything else is so snug. All the letters now have thicker strokes and are more squared-off, though still with some rounded corners. The E’s show the most change. 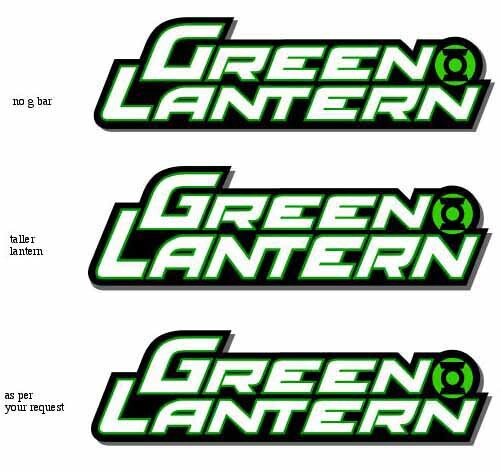 I think I would have tried to slant the lantern symbol (really the GL ring or chest symbol) to match the letters, but perhaps he wasn’t allowed to do that, or just didn’t want to. 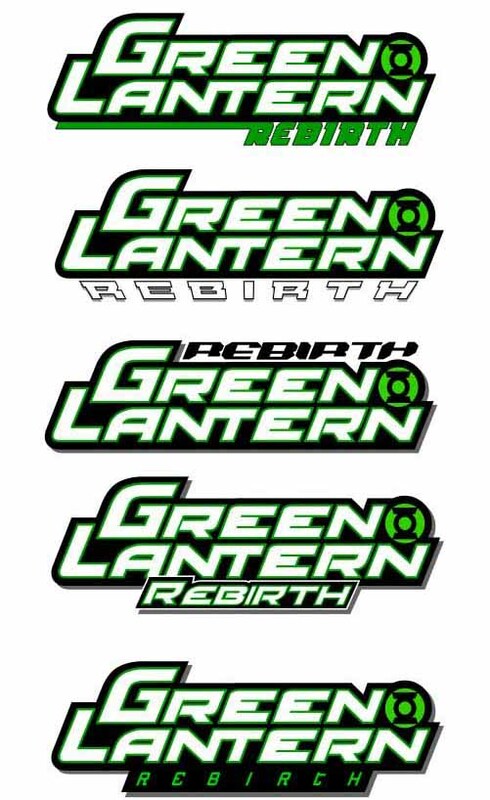 These are all interesting, though the third one puts REBIRTH at the top, which doesn’t read correctly, and on the second one the tagline has a completely different perspective and angle, so I can see why that wasn’t chosen. Check back to the top of this article and you’ll see that DC chose the final version, but with the letters closer together and pushed to the right side. I think this was a good move, as it provides a nice balance to the larger G and L, and the letterforms used for REBIRTH are very modern, yet provide great contrast to the rest, being thinner and perhaps suggesting computer type. In all, a fine job, Daniel, and thanks for sharing your process. 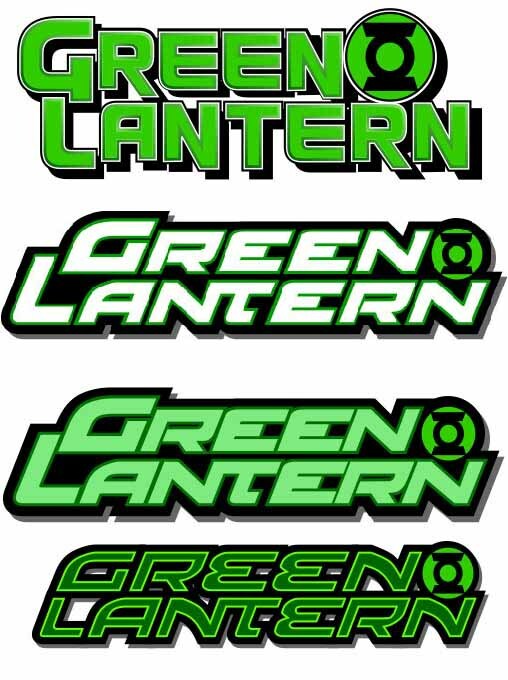 For this logo, Ken Lopez added a large CORPS to Gelon’s GREEN LANTERN, putting the ring symbol in the O, where it works perfectly, and adding the tagline RECHARGE. Daniel reports that some of his ideas were incorporated in this design, so I’m not sure what’s his and what’s Ken’s, but it all works well to my eye. Considering how long the title is, the compact layout takes up a surprisingly small section of the cover, and putting the emphasis on CORPS for this one makes lots of sense. 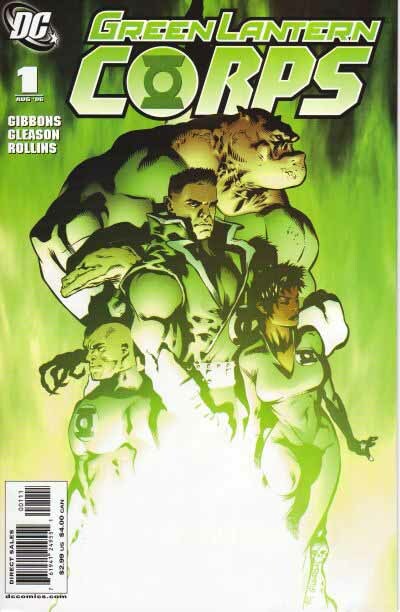 Here’s the logo on the first issue of the new monthly title, ably written by Dave Gibbons, an old friend to the Corps. 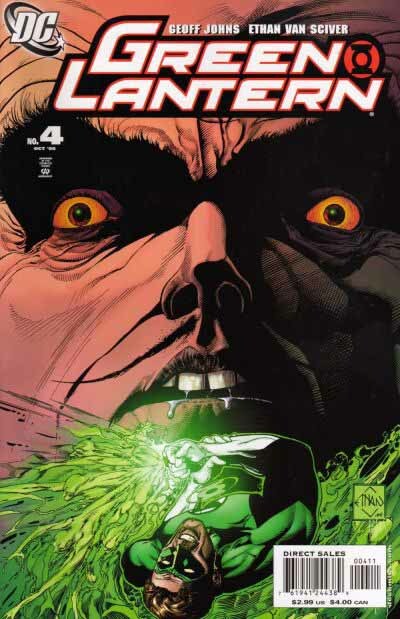 We’re up to date, at least until the next shakeup in the world of Green Lantern. Hope you’ve enjoyed the journey as much as I have. This entry was posted in Logo Studies on November 19, 2007 by Todd. Really enjoyable insights, as ever. So who’s next – Wondy? Thanks, Martin. Haven’t decided yet, enjoying a break at the moment. Fantastic. I think I like #6 best, perhaps for the symmetry. Something in that logo reminds me of the new Booster Gold one–Todd, have you seen this? Did Daniel Gelon do it? There’s a wonderful little infinity symbol I didn’t get for a month or so. I don’t think he did that one, at least it’s not on the list he gave me. Love these logo studies! I’d be very interested in an Aquaman logo study. I think his second one is the most iconic, but would love to hear your thoughts. Thanks, Roger. I’ll get to Aquaman eventually.